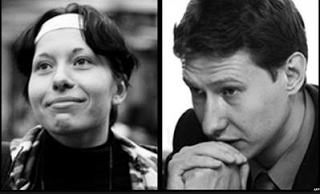 On 19 January 2009 human rights lawyer Stanislav Markelov and journalist Anastasia Baburova were shot dead on Moscow's Prechistenka Street. 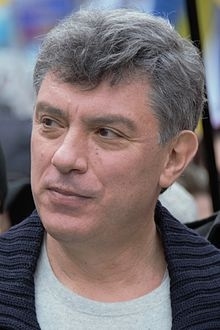 Rights in Russia was set up one year later on 19 January 2010, the first anniversary of their deaths, in their memory. 18 May 2017 is the 73rd anniversary of the 1944 Deportation of the Crimean Tatar people from their homeland. From Wikipedia: "The forcible deportation of the Crimean Tatars from Crimea was ordered by Joseph Stalin as a form of collective punishment for alleged collaboration with the Nazi occupation regime in Taurida Subdistrict during 1942–1943. The state-organized removal is known as the Sürgünlik in Crimean Tatar. A total of more than 230,000 people were deported, mostly to the Uzbek Soviet Socialist Republic. This included the entire ethnic Crimean Tatar population, at the time about a fifth of the total population of the Crimean Peninsula, as well as smaller numbers of ethnic Greeks and Bulgarians. A large number of deportees (more than 100,000 according to a 1960s survey by Crimean Tatar activists) died from starvation or disease as a direct result of deportation. It is considered to be a case of ethnic cleansing. For a long time Crimean Tatars and Soviet dissidents called for recognition of the genocide of Crimean Tatars." 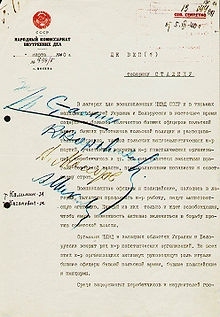 "The Katyn massacre, a series of mass executions of Polish nationals carried out by the NKVD (People's Commissariat for Internal Affairs) in April and May 1940, was prompted by NKVD chief Lavrentiy Beria's proposal to execute all captive members of the Polish officer corps, dated 5 March 1940, approved by the Politburo of the Communist Party of the Soviet Union, including its leader, Joseph Stalin. 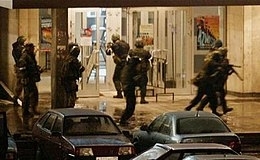 The number of victims is estimated at about 22,000. The victims were executed in the Katyn Forest in Russia, the Kalinin and Kharkiv prisons, and elsewhere. Of the total killed, about 8,000 were officers imprisoned during the 1939 Soviet invasion of Poland, another 6,000 were police officers, with rest Polish intelligentsia that the Soviets deemed to be 'intelligence agents, gendarmes, landowners, saboteurs, factory owners, lawyers, officials, and priests'." On 23 February, 1944, the Chechen and Ingush peoples were deported to Siberia and the northern regions of Kazakhstan by order of Joseph Stalin. The operation, conducted on the spurious grounds that the Chechen and Ingush people had collaborated with the Nazis, was carried out by the NKVD, then headed by Lavrenty Beria. An estimated 500,000 people were deported and the Chechen-Ingush Autonomous Soviet Socialist Republic was abolished. Tens of thousands of Chechens and Ingush died or were killed during deportation and in the first years in exile. 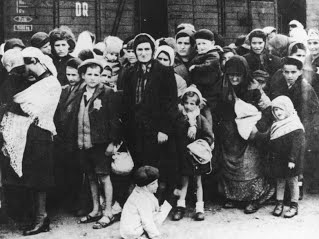 Survivors were only allowed to return home in 1957. On 26 February 2004 the European Parliament voted to recognize the deportation as an act of genocide.